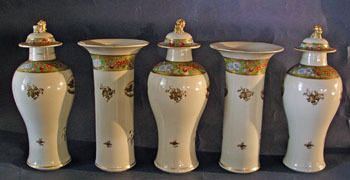 A Great 5 Piece Chinese Export Porcelain Garniture Set with Famille Rose and Sepia Decoration. and cracks to one baluster form vase. Baluster form vases are 12" tall and the Trumpet form vases are 10" tall.